The 6.3-cubic-foot LG LRE3083SW is a freestanding, smooth-top range that heats quickly and maintains even, consistent temperatures in the convection oven. It also has a self-cleaning mode that takes just 20 minutes, but it's most effective for light cleaning. Excels at all cooking functions. In professional testing at ConsumerReports.org, the LG LRE3083SW earns a Recommended nod, with excellent ratings in all categories. That includes both low and high heating performance on the cooktop; baking and broiling in the oven; oven capacity, and self-cleaning abilities. Owners agree with all of those assessments, but also praise the convection feature that speeds up both preheat times and cooking times. A number of users who have never had a convection oven before wonder what they ever did without it. Quite a few owners have tested the temperature with an oven thermometer and say it's absolutely accurate at any setting. Convection, and a keep-warm element. The cooktop on this LG smoothtop electric range has five elements -- one of which is a 7-inch warming element that keeps prepared dishes warm while the remainder of the meal is cooking. There's also a dual-diameter element that can be adjusted to fit either small or large pots. The 6.3 cubic foot oven features convection cooking and a fast, steam-cleaning mode that cleans up light messes in 20 minutes. The all-digital controls draw kudos for being easy to use and clean -- there are no knobs you have to wipe around. Owners also like having the ability to punch in precise cooking times and temperatures using a numeric keypad. 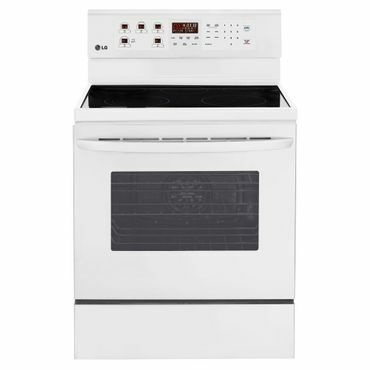 The blue oven interior provides a bit of an upscale look to what's most decidedly a mid-priced stove and this range comes in four colors; white, which we review here, black stainless steel as the LG LRE3083BD (Est. $1,100), stainless steel as the LG LRE3083ST (Est. $1,000) and black as the LG LRE3083SB (Est. $950). Also, while we list retail prices here, this oven can often be found on sale. Good track record, mostly. User satisfaction with the LG LRE3083SW runs very high. There are a few scattered complaints of ranges that failed prematurely, and of customer service that's not as helpful as it could be, but not many. Large surveys paint a mixed picture. One that measures repair rates puts the LG brand at the bottom based upon a survey of 10,738 consumers who purchased their electric ranges new between 2011 and 2016. However, a J.D. Power and Associates survey that measures owner satisfaction with their kitchen ranges puts LG in the top tier. The one year parts and labor warranty isn't especially generous, but is typical. A variety of burner sizes.